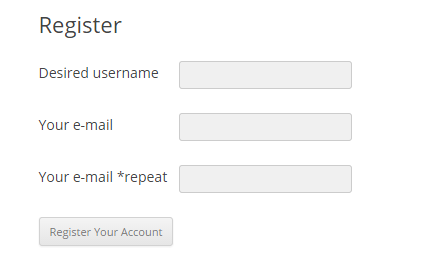 The scenario of registration is this: a user fills in a form, selects a username and provides an email address. 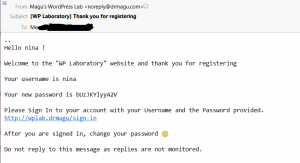 Assuming neither corresponds to a currently registered user, the user is registered with her selected username, and an email with the initial password is sent. We will use the shortcode “ferl_register_form“. The development parallels what we have done before. After registering the shortcode, we create the register_form() and register_form_view() methods. Of course we also make a “Register” page to host the shortcode. The Controller looks for the “ferl_action”, and calls the appropriate method in the Model. We add a case statement for the “register” action, which hands off to the Model register_user method.. The Model takes care of making sure the selected username and email address are valid. If they are, the user is registered and a random password is generated which is then emailed to the new user. Note that we also added some validation methods to the Model. Some final comments on the next page.